Lock in a great price for Bluesun Hotel Borak – rated 8.1 by recent guests! So we were upgraded to stay at Hotel Elphuson their sister hotel. The hotel was perfect, rooms were clean and comfortable. Breakfast was delicious, a lot of options. Staff was friendly. 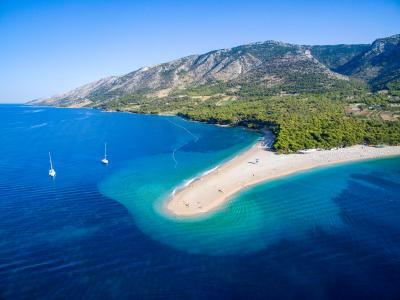 The location is excellent, nice view in front of the sea, and between the Zlatni rat beach and bol center. Staff is very professional, smiling and welcoming. Excellent breakfast. Very good value for money, and in addition you get a discount for some restaurants and attractions. Great breakfast. Location can't be beat - 10 min walk to Zlatni Rat. Hotel has its own pool but you should try going to the beach before resorting to the pool. Very friendly staff, helpful and cheerful. The hotel has pool and nice restaurant. Good spread for breakfast. Excellent location between beach and town center. Seaside rooms have nice patios. Breakfast was loaded with options. There is a great selection of food that could satisfy any kind of taste. Steps to the beach, walking distance to the main city Center. Bluesun Hotel Borak This rating is a reflection of how the property compares to the industry standard when it comes to price, facilities and services available. It's based on a self-evaluation by the property. Use this rating to help choose your stay! One of our top picks in Bol.Only 150 feet from a pebble beach offering a restaurant, Bluesun Hotel Borak is set in lush Mediterranean greenery and features an outdoor swimming pool with sun deck. All rooms have free WiFi and LCD satellite TVs. 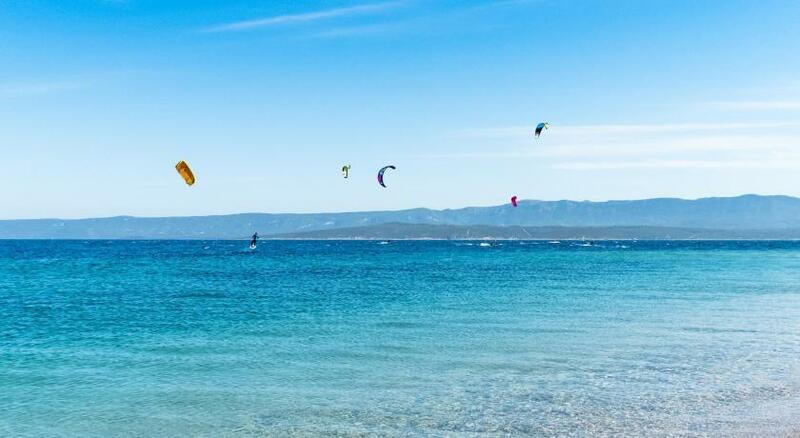 Borak Hotel is located next to the walking path that connects the well-known Zlatni Rat Beach with the picturesque village of Bol, both less than a 10-minute walk away. Bolero Cocktail Bar invites to relax in the shade of pine trees. Hotel restaurant serves rich buffet meals, while drinks from the bar can be enjoyed in the lobby or on the free sun loungers on the poolside terrace. A small children's pool and children's entertainment staff are also at guests' disposal. A souvenir shop is provided on-site, while the hotel's TV room can also be used for group meetings. Scuba diving equipment and lessons can be arranged at the hotel's scuba diving club. Day trips to the Blaca Desert, Vidova Gora Hill, the Brač Stonemasonry School and other attractive sites can easily be booked at the reception desk. When would you like to stay at Bluesun Hotel Borak? This air-conditioned room features a bathroom with shower or a bathtub. Amenities include a TV and a mini-bar. This air-conditioned room features a balcony and a bathroom with shower or a bathtub. Amenities include a TV and a mini-bar. This air-conditioned room features a bedroom and a living room. Amenities include a TV and a mini-bar. Please note that the rate includes up to 2 children until 13 years of age, which can sleep free of charge on the sofa beds. Please note that older children and adults are charged extra, 40 % of the room stay per night. There is no capacity of extra beds. This suite features a balcony, a bedroom, a living room and a bathroom with a bathtub. Hotel Borak is located right by the sea and hidden within a pine forest, with views of the crystal blue sea. The promenade leading to Zlatni rat Beach is right in front of the hotel. We invite you to relax with a cool drink by the pool and experience your dream vacation. Borak Hotel is the ideal destination if you are looking for clean sea, pristine and beautiful nature and an active holiday. Hotel Borak is part of Bluesun Hotels & Resorts, a company that includes 15 hotels, campgrounds and resorts all over Croatia. More than 150,000 international guests per year choose Bluesun hotels for their vacations. House Rules Bluesun Hotel Borak takes special requests – add in the next step! Bluesun Hotel Borak accepts these cards and reserves the right to temporarily hold an amount prior to arrival. Amounts of the lunch and dinner supplements listed in the booking confirmation are only valid for online bookings. In case you order supplement meals on site at Bluesun Hotel Borak, the price of dinner is 24 EUR per person. Please note that the amount of available extra bed and rates vary due to room type. We only stayed 4 nights. Everything!!! lovely view from room with balcony, room was very comfy and clean. Great staff! good choice of food and drinks, indoor and outdoor heated pools. Good bar area with fantastic sunsets. Oh and great Kebab from snack bar! There was no iron in the room which was really annoying as I couldn't wear half of my clothes. We were upgraded to the neighboring 4* hotel upon our arrival. The hotel facilities were great, location fabulous. The hotel is dated , the rooms although very clean need an update and spruce. The aircon did not work, thankfully it wasn't in the height of Summer. Beds weren't the comfiest. Breakfast was ok, the hot breakfast options weren't cooked the best. Great location, swimming pool area was very well kept and clean, the whole area was kept immaculate, inside and out. Helpful staff. The cleaning ladies were lovely and very helpful. The rooms were always cleaned nice and early. Getting the deposit for the towels back was quite complicated, but in the end it worked out. Beautiful location by the sea. Great pools. Nice rooms, good breakfast, friendly personnel. Within walking distance from a lively town and long stretches of beach. Beds was O.K. Food was good. The timings for dinner (ended too soon at 21.00)! Location, the property was modern, clean and staff friendly! Great value for money. Hotel has big area around it. Beautiful nature and quietness. Great pool, also sunbeds at the sea. Nice breakfast. Private parking. With the Autumn Special Offer package, value was largely in line with price. Convenient parking solution. The waiter was very polite, but the restaurant manager was grumpy and impatient, and I heard him tell the waiter off..this should be done in private, and not within the earshot of the diners. The food was good value for money, good location, excellent reception staff, very helpful. Especially the tall lady with blond hair. Staff, location, food, facilities, everything.